The Russian air war against al-Qaeda in Syria (the Nusra Front or the Support Front) took a tragic turn on Saturday when a missile hit a downtown government building complex and prison in Maarat al-Numan. It left some 51 or more dead and 70 wounded. The Russians also bombed nearby towns of Saraqib and Khan Shikhun. Presumably the inmates in a prison run by al-Qaeda were a mixture of other radicals (perhaps Daesh [ISIL, ISIS] and liberals of the former Free Syrian Army. Whether what we would consider criminals were in the prison I don’t know. Al-Qaeda runs its territory in Syria in a Taliban-like way, with morals police and social regimentation. So some prisoners could just be people who didn’t go along with the al-Qaeda state practices. Alarabiya is reporting that some of those killed or wounded were in the downtown market adjacent to the government buildings. Russia needs to be more careful or it will end up simply alienating all the ordinary Sunnis in Syria with these blunt tactics. Locals are demanding that Russia be charged by the international community with war crimes. The killing of so many non-combatants underlines how blunt the use of air power in a guerrilla war is. Critics are saying that Russia has adopted the same lazy and deadly air tactics as had the Syria regime itself. This is a fair criticism. The US critique of the Russian strike, however, is just misdirection and hypocrisy. 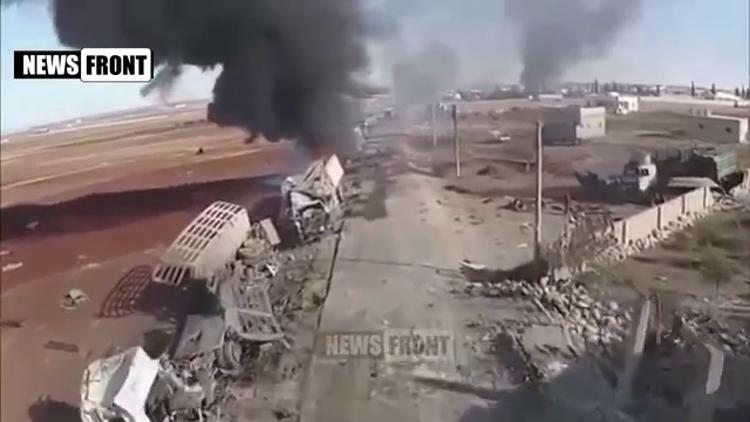 I oppose the Russian airstrikes in Syria, but the fact is that Russia is clearly hitting al-Qaeda-held territory. The US pretends that al-Qaeda doesn’t exist in Syria or that it isn’t the threat that Daesh (ISIS, ISIL) is. But al-Qaeda is more dangerous to the regime than Daesh, and it is generally a dangerous organization that reports directly to Ayman al-Zawahiri, the mastermind behind the 9/11 attacks on New York. There is every reason for Russia to bomb al-Qaeda in Syria, and more reason to bomb it than to bomb Daesh, which is off in the eastern desert. Russian strategy is to push up from Homs north into Idlib and take the province back away from al-Qaeda and its allies in the Saudi and Turkey-backed Army of Conquest. It is suspicious to me that the State Dept. is complaining about this campaign, and I think it may be because the US itself in Syria is allied with allies of al-Qaeda. Everyone in Washington will have forgotten that the US routinely bombed civilian cities during its occupation of Iraq. Here is an example, in which the US killed 49 with one strike on Sadr City. Here is another, considering the matter as tactics and strategy. Not to mention that when it bombs Raqqa and other Daesh-held cities even today, the US kills civilians regularly. Just a month ago, the US killed 26 civilians in Khan in Hasaka province during attempted strikes on Daesh positions. A brow of the arrogant, a skull of the debonair!